Apple Graphics held a Vehicle Wrap Training course on March 8th. We had 3 trainees that day from NRI Color Graphics in Lawrenceville, NJ. Their company was expanding and getting involved in the vehicle wrap industry, so they wanted us to train them and give them the skills they need to wrap on their own. It was a successful Vehicle Wrap Training course. The trainees, along with our Professionals' guidance, wrapped a Rita's Water Ice trailer. We trained them in every aspect of a vehicle wrap, including how to use the equipment, vinyl removal, placement of vinyl, application, post heating, and more. We were very pleased with the outcome of the Rita's trailer. Apple Graphics would like to thank NRI Color Graphics for attending our Training. 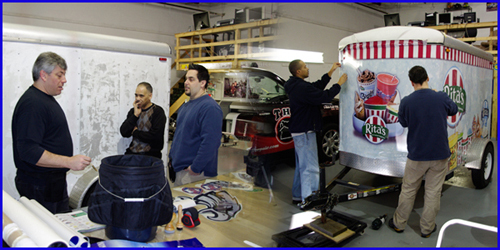 Anyone interested in Vehicle Wrap Training, contact us today! Training courses fill up quickly, so call Apple Graphics to secure your spot! Check our calendar for upcoming dates.